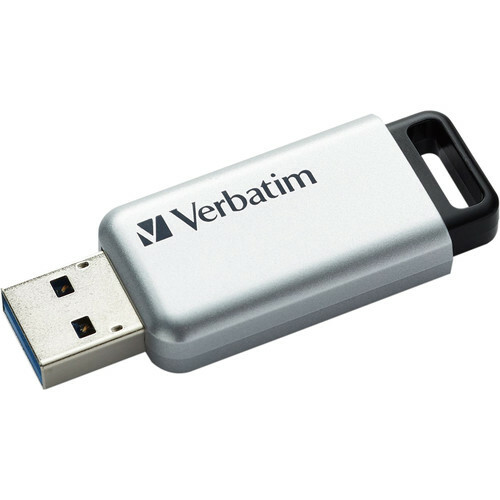 Store and protect 64GB of data with the Store 'n' Go Secure Pro USB 3.0 Flash Drive from Verbatim. With built-in 256-bit AES hardware data encryption your important files are kept safe and secure. This flash drive even protects data against both password hacking and brute force attacks. USB 3.0 connectivity allows for fast data transfers to streamline workflows while the slide-out housing helps to protect the USB connector when on-the-go. Box Dimensions (LxWxH) 4.2 x 2.6 x 0.3"